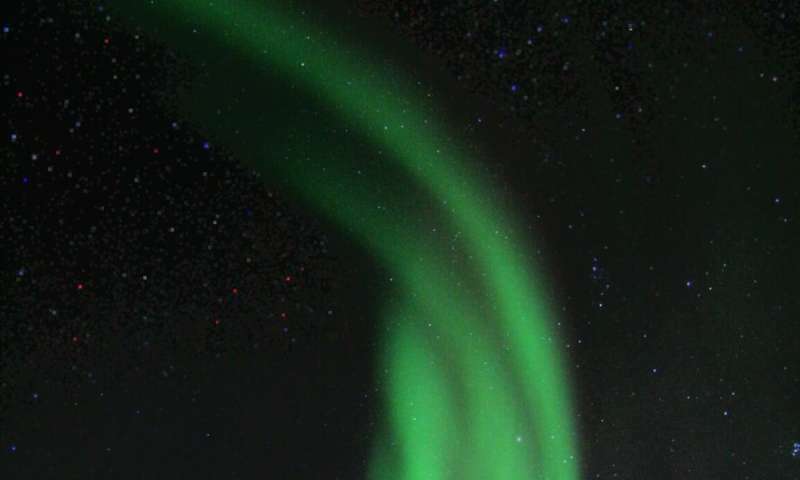 Now, a new study in the Journal of Geophysical Research: Space Physics, a publication of the American Geophysical Union, explains how this asymmetry comes about and causes the differences in auroral displays near Earth's poles. The new research finds the differences in aurora are likely caused by squeezing of Earth's magnetotail—a magnetic tail that extends away from our planet—by the solar wind and the Sun's magnetic field. When the solar magnetic field arriving at Earth is pointing in an east-west direction, it interacts with the Earth's magnetic field differently in the north and in the south. This leads to asymmetric loading of pressure onto the Earth´s magnetic field and introduces a tilt in the Earth's magnetic field on the nightside of the Earth. The tilt explains why aurora sometimes can have different shapes and occur in different locations in the two polar regions. "The reason this is exciting is that earlier we have thought that the asymmetry in the system enters the magnetosphere by a mechanism called tail reconnection," said Anders Ohma, a Ph.D. candidate at the University of Bergen in Norway, and lead author of the new study. "What this paper shows is that it's possible that it is actually the opposite: This reconnection in the magnetotail is actually reducing the asymmetry." "Without including these asymmetries our understanding of the Sun-Earth system will be far from complete and models will not be able to accurately predict the location and timing of geospace phenomena," said Nikolai Østgaard, professor and head of the Birkeland Centre for Space Science at the University of Bergen in Norway, and lead author of the study in Annales Geophysicae. Earth's core generates a magnetic field extending into outer space around our planet, forming a magnetic shield called the magnetosphere that protects the Earth from charged particles coming off of the Sun. The Sun emits its own magnetic field, called the interplanetary magnetic field, or IMF, that is carried by the solar wind and interacts with Earth's magnetic field. During certain conditions, on the dayside of Earth, the Sun's interplanetary magnetic field lines and the Earth's magnetic field lines can be ripped apart and cross, connecting Earth's magnetic field to the IMF. The solar wind flowing from the Sun moves these crossed field lines to the nightside of Earth and stretches it into a tail – called the magnetotail – that extends away from the Earth. Eventually, these crossed field lines are pulled apart and the Earth field lines rejoin with Earth field lines, and the IMF field lines rejoin with IMF field lines. Once the field lines are closed, they snap back towards Earth, accelerating particles nearby and causing auroral displays in the Earth's upper atmosphere. "This study explains both how asymmetries are created and how it is removed and it is exactly opposite of what I and many researchers have thought," said Mike Liemohn, editor-in-chief of JGR-Space Physics. "Therefore, this result is kind of big deal." Amusingly the plasma ignoramuses find their pseudoscientific claptrap is not responsible for the phenomena in contradiction to their guesswork. & amusingly, cant continues to criticize any work for which he has no competency to judge. Unsurprisingly, @cd completely misses the point since it never reads the article, just scans it for the "juicy parts" which appear to confirm his bias. My tip @cd: read the article again, wise-guy. You don't even know the basics of plasma conductivity. Talk about ignorant. I'm waiting for the timekeeper to signal that I can toss my terrier in with the vermin. "Place your bets, gentlemen! Last call to place your bets!" cantdrive85 has no genuine interest in science or understanding of how it works--and posts here purely for the reactive comments. Expecting cd85 to comment intelligently is akin to expecting Tronald Dump to act presidential--always to look foolish for having done so. So don't gratify, or vote for, trolls.